Eugene just pointed out the fact that I'm just a few days short of the finish line with this whole NaBloPoMo thing. I'm actually pretty amazed that I was able to make it this far considering my performance (or lack of) last year. The irony is that during these past several busy weeks, I had less trouble thinking of things to write about than these past couple lazy days. It's the inertia of the holidays, I suppose! The truth is that I've actually spent the past couple days planning for the next big holiday...Christmas! 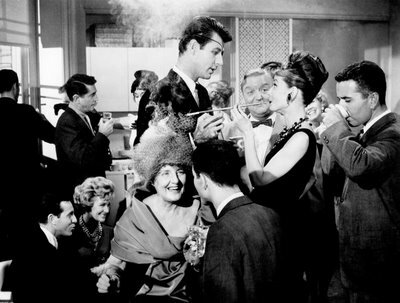 I usually throw a big cocktail party each December and all my friends make the trip up to our apartment where we go through dozens of bottles of wine and champagne and stay upright thanks to the various platters of canapes. 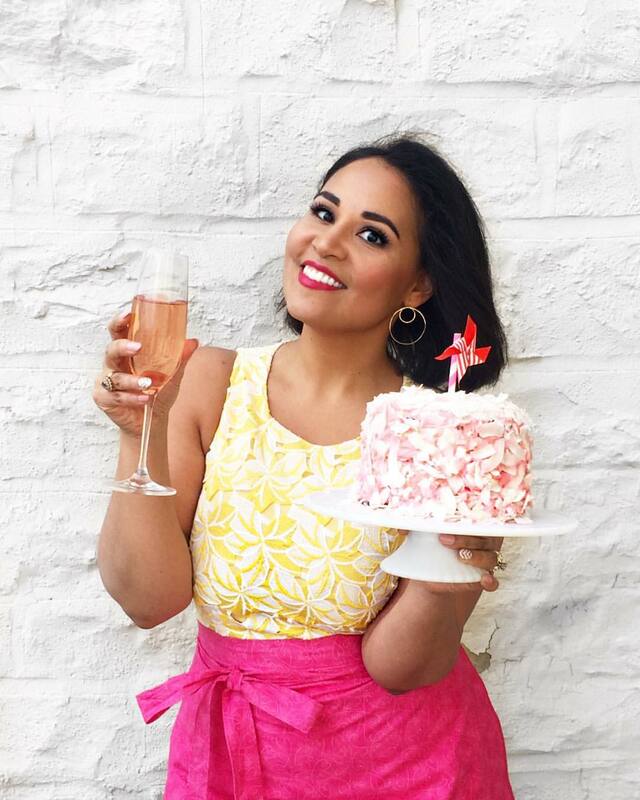 This year I decided to give in to my obsession for all things retro, and will be hosting a classic 60s era cocktail party...complete with a full bar, classy glasses, and an array of early-60s recipes culled from my collection of used bookstore finds. I'm talking rumaki and molded jiggly things here! 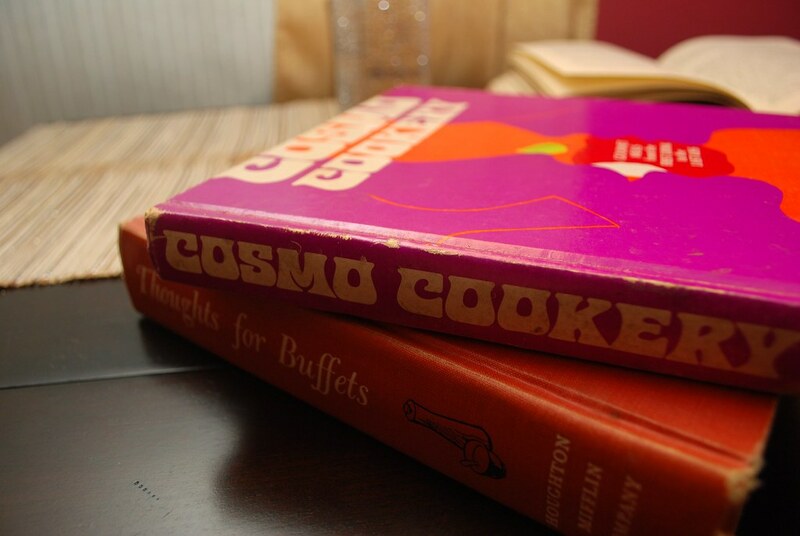 I've been busy shopping for vintage trays on eBay, practicing my bouffant hairstyle, and leafing through these wonderful vintage cookbooks. Like one book called "Thoughts for Buffets" which is filled with hundreds of party recipes, cocktails, and fabulous table decorating ideas. Occasionally I'll look up from the book and read out one of the recipe combinations to Eugene who grimaces and flinches and asks me if I expect people to actually eat this food. 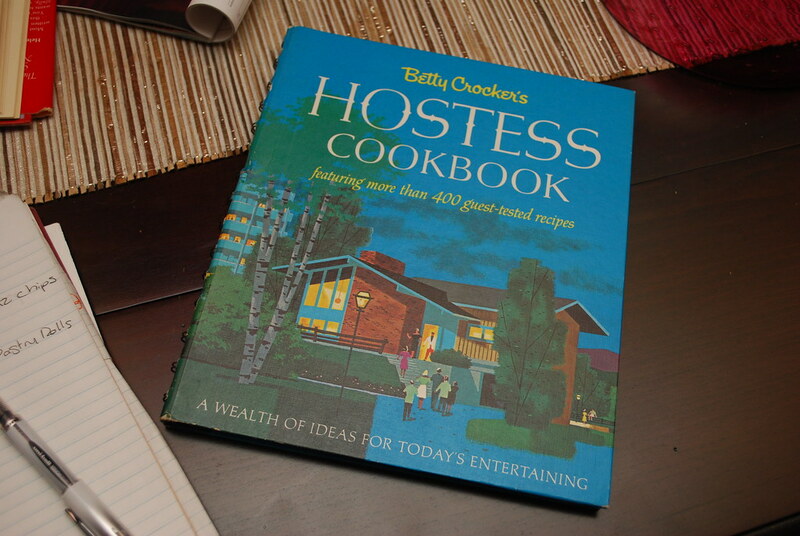 And then there is the Betty Crocker Hostess Cookbook, which I was determined to get my hands on the minute I spotted it propped up on a stand on Betty Draper's kitchen counter. It took me a couple On Demand "rewind and pauses," before I was able to figure out the title, but after that, it wasn't long before I located a first edition in fantastic condition. A funny thing is the book was actually published in 1967 for the first time. And yet it somehow managed to show up in several episodes of Mad Men dated 1962 and 1963 (as evidenced by last years New Year's party and Kennedy's recent death). It's unusual since the set dressers for the show tend to be pretty fantastically accurate. I'm happy to ignore the anachronism though because the recipes in it are just priceless. As it promises on the cover, it's filled with "a wealth of ideas for today's entertaining." And (even better) they're illustrated with absolutely awful photos. The kind of photos that would totally get rejected from Tastespotting for "unflattering composition," "lighting," and "not sharp." The recipes and photos are accompanied with wonderful tips for the hostess, and delightful suggestions like "Salad is enough when it's just the girls, but if men will be joining you at lunch, be sure to serve a real man's meat." I'm ridiculously excited about this party, and as you can see, am diving into the preparation like it's my job. I thought I should warn you since it's inevitable that my "research" will soon start appearing here on the blog. YES!!! Actually it's funny because I was practicing my 60s hair the other day (Thanksgiving) and my mom asked me if I had a "Bump-it" in my head. I was like "Oh no. That's just 100% Jersey girl teasing." A slightly later era, but same principles apply. I wish I could be there for the party! I love hearing about all of your planning on Twitter. It totally makes me want to plan a dinner party based on the same theme. I hope you're searching for a totally retro outfit to wear as well! Brilliant! 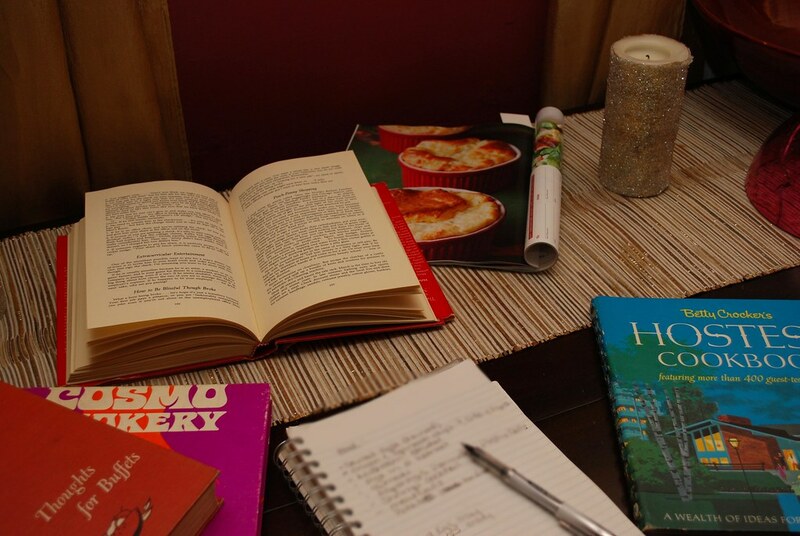 I absolutely have to hunt down that fabulous cookbook as well. Theme parties are my favorite. 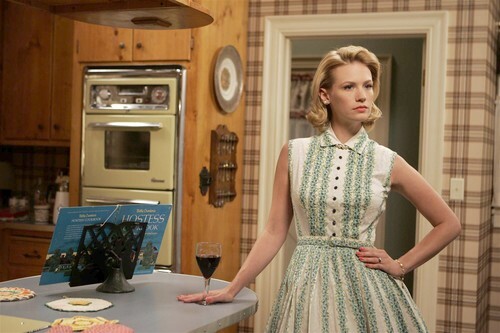 I hope you've found a gorgeous Betty Draper like dress to play hostess in as well. You're getting me so excited for the holidays now! Last year I threw my first cocktail party on New Year's Eve and it was a ton of fun. Can't wait to hear about yours. You had me at the Breakfast at Tiffany's photo.